Will the genealogy research you've done and the story you want to tell your future descendants about their ancestors survive to be told? Unfortunately, your digital files may become useless for future generations if they remain untouched for as little as one generation, or about 25 years. For genealogists who are storing their research digitally, one of the intended goals is for future generations to enjoy their research; however, experts in digital preservation are in agreement that today's digital records probably won't survive and be readable for as long as they were originally intended. This means the genealogy data we have all worked on tirelessly may become no different than dust in the wind. And unfortunately, most people are totally unaware of the reasons why the data stored on their PC or other storage devices won't survive for long periods of time and what they can do to deal with this problem. So why are our digital files in so much jeopardy? What are the problems with the longevity and accessibility of your digital records? We all enjoy the benefits of the digital revolution from less paper to more convenience, but when it comes to the longevity of our digital data, we don't realize how much of a weak link our digital files really are when it comes to long-term preservation. While various forms of digital storage are great for us to use in our daily lives, none of them are a viable or reliable long-term method for storing and passing on our genealogy information to someone who will treasure it 25, 50, or 100 years in the future. So although the personal computer has allowed all of us to accomplish more and in far less time than at any time in the past, it doesn't allow us to save our work in such a way that it will be readable for extended times into the future. Here are the reasons why. Physical decay of the media resulting in the loss of digital files - The lifespan of bits and bytes of data pales in comparison to the written word. Nobody really knows for sure how long data on various types of removable storage will last and it can vary by the manufacturer and the conditions of storage. So what may last 20 years for one individual may fail in 10 years for another. Although accelerated lifespan tests have been done on different types of optical and magnetic storage, the results seem speculative or dubious when you've personally experienced any type of data corruption or storage medium failure in your own lifetime. All it takes is just one bad sector and your whole file can be can irretrievable or unreadable. Your entire disc doesn't have to totally decay for the data to be unreadable. Technological obsolescence of the storage medium - If you've used computers for any length of time, you have plenty of memories of the different types of storage medium that you've used to save your files. Everything from 5 & 1/4 and 3 & 1/2 inch disks to Iomega Zip disks and tape drives. Although you may be able to still buy these used devices on eBay in the near future, will PC's of the future even have the right type of connectivity for these outdated drives, and will the motherboard and operating system of the future PC's support them? If you've ever tried to connect old hardware to a new PC, you already know the answer. As technology advances at an even more rapid pace in the future, it will be doubtful that 50 or 100 year old devices will be available or used by anyone other than a digital archaeologist. Nobody knows how much longer CD's, DVD's, and USB thumb drives will be around for, but if the past is any indication of the future, the types of digital storage used and the ways they will connect to a PC will continue to change and evolve. So even if your digital files don't decay, will your descendants be able to retrieve your data from them? Technological obsolescence of the file format - If your descendants get lucky and your data hasn't decayed and they hired a digital archaeologist to get your data off of your antiquated storage medium, what hurdle do they have to overcome next? Proprietary genealogy file formats shouldn't be counted on to survive. Think of all the different software that you've already owned in your lifetime and how many of those companies are still in business today. So your descendants and the digital archaeologist that they hired now have to deal with the unavailability of the software or the operating system to run it on. If they can overcome those factors, then they must next migrate your old genealogy database file into a contemporary genealogy software program and hope that there isn't any loss of data or formatting during the process. Think of software that you used 10 to 20 years ago. Is the manufacturer still in business so you can buy a current version? Can you install your software from the 1980's or 1990's on the operating system of your current PC? Can you open any of the files that you had created with those older programs? A digital file depends not just on the specific software program that was used to create it, but on the entire operating system software and the hardware that allowed that original software program to run. Physical loss of the storage device - Regardless of whether your data is even readable and hasn't become corrupt is the very real problem that it might just get lost or thrown away either on purpose or inadvertently by someone in the future for a variety of reasons. If it is on CD or DVD and mixed in with a larger stack of disks, it might get thrown out simply because someone doesn't want to have to inspect every file on every storage disk or thumb drive you own. Or a more likely scenario is that the storage medium that your data is on is so antiquated that nobody feels it is worth it to hire a digital archaeologist to recover and convert the data in order to see what it is. You've probably come across old disks that you have created or used in the past when PC's had disk drives and felt the same way - and that's after only 10 or 20 years. You figured that if you've lived without whatever data was on the disk that it couldn't have been that important. Don't expect that your descendants will feel any different. While your spouse may keep everything you owned out of respect or ignorance, will your descendants save every CD, DVD, disk, and thumb drive that you ever owned and pass them down? It's not very likely. Another very real factor that will contribute to accidental physical loss is the mere size of storage medium. Today many people use a thumb drive to back up important files, and you may even have a collection of these handy little devices. While you may know exactly what's on each and every one of them, their mere size prohibits you from labeling them in any useful or long-lasting fashion. Compounding this problem is the perceived usefulness and value of any storage medium that passes on from you to someone else in your family since it diminishes rapidly over time because of the galloping speed of technological advancement. It's different than jewelry, kitchen appliances, china, or power tools that get passed on. These small storage devices have become so inexpensive and common that they have no perceived value by others. So between small, unlabeled, and antiquated, the likelihood of today's storage medium being kept by successive generations may be small. What are the 7 easy steps you can take to insure that your genealogy research survives? In a perfect world of the distant future, man may someday invent and perfect a method for very long-term data archival. Unfortunately that is only a dream for now, but there are practical methods which you can begin to employ immediately to preserve your genealogy data. The key is to begin using these steps now and make them a regular part of your family history research. The majority of these steps are designed to deal with the loss of your digital data at some point in the future and also to preserve your paper documentation. Chances are that you've already spent hundreds or even thousands of hours doing genealogy research. Don't put off taking these easy steps any longer. Your cost in time and dollars is small compared to your existing investment. You already know how valuable and meaningful your research is - more so than anyone else who is now alive. If you really want it to survive because of the treasure it is, you have to make it very easily identifiable as a treasure and both easy to store and view. Just like your genealogy can't remain solely as a digital asset and survive long term, it also can't be boxes of files or papers that someone in the future may not appreciate or understand their significance either. As a result, your strategy must be to make your genealogy research something that is easily identifiable, easy to understand and enjoy, and significant enough that future generations will treat it as a treasure. So let's review 7 easy steps you can begin using today. Print an easy to read and understand ancestor chart - Your research on direct ancestors is really the most interesting and important part of your work that most of your descendants will really want to see so print an ancestor chart first. Then every few years print an updated version if warranted based on new information and corrections you've made. Don't keep putting it off until you think you're done with your research or you run the very real risk that it will never get done. A printed ancestor chart displays the cornerstone of the most important part of your research that you want your descendants to see in an easy to understand format. Seeing your research all together on one chart is also an invaluable asset that will allow you to easily see what you really have and to correct any mistakes you've made. 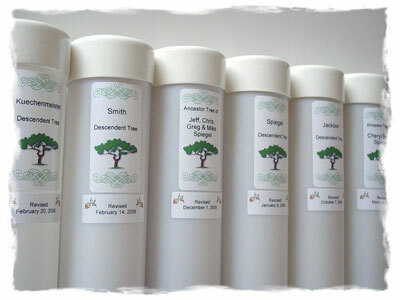 Most importantly, charts that we print for you will come in labeled tubes which are easily identifiable and much less likely to be thrown out by mistake by some future family member. If your budget allows, you can also consider printing various descendant charts over time which would include aunts &uncles, brothers & sisters, nieces & nephews, and in-laws. Print various genealogy reports - Most genealogy software programs come with a number of different reports that you can easily print right at home on letter size paper. 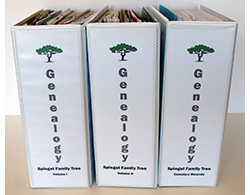 Although definitely not as easy to understand and follow as a printed chart, these reports will provide additional information such as citations and biographical notes you've made which doesn't appear on traditional genealogy charts. A printed chart wins hands-down in ease of understanding, but a printed report wins hands-down if you have a lot of biographical information included as well. That's why having both will give you the best of both worlds. We all already know that not everyone in our family shares the same intense passion for genealogy research that we do, but every few generations there is always the likelihood that a new family member will pick up where we left off. They are the ones who would appreciate more than just the basic chart of your ancestors, and they are the ones who will invest the hours reading and reviewing your more detailed information. Just think of the great "find" you can leave for that particular descendant. Since we don't know how many generations in the future that will occur, it is incumbent upon us to make sure that what we leave behind also includes the additional biographical sketches, research notes, and source citations which won't appear on your printed genealogy charts. Keep a handwritten genealogy chart as a back-up - For decades prior to the advent of personal computers and genealogy software programs, family historians would purchase blank charts and fill their ancestral data in themselves. Before that people used the family Bible. By utilizing these same methods from the past, you will insure that any new discoveries you make that were not on your most recent printed chart will be clearly visible on your handwritten chart. You can purchase these blank genealogy charts through our web site. They are available in different sizes to handle anywhere between 5 and 10 generations of ancestors and come with either a plain background or a decorative background like the one shown to the right. Back up your genealogy data on a regular basis using two different methods - Regardless of what portable storage medium you use, label it and then keep it in the front inner pocket of your genealogy binder. Since proprietary genealogy software file formats shouldn't be counted on to be usable 25 or more years later, also export your genealogy software data to a generic GEDCOM file as well. A GEDCOM file is a generic type of genealogy database file that can be imported into any proprietary genealogy software program. If your GEDCOM file survives and is still a usable format, your descendants may be able to migrate the data into a current genealogy software program of the future. Make an easy to identify binder or box of your source material - Develop a method of storing your source documents so that they are well organized, attractive, and most importantly that your packaging sends a clear message - I'm important - don't throw me away. Many well-meaning people throw away important family history documents after interpreting them as just old papers or memorabilia by mistake. A simple, easy to identify binder which includes your reports along with your most important documents like military records, biographical sketches, obituaries, and birth, marriage, and death certificates is more likely to remain in someone's home over many generations rather than a an unorganized box of papers that is 50 to 100 years old. Office supply stores sell expanding pocket pages with dividers which will allow you to put a sizable amount of documents or papers into each pocket. If you have a lot of material, you can use several 4-inch binders. Nobody knows the importance of the various documents you possess more than you do, so don't expect someone in the future to sort out the important ones and pitch the rest. Do that job now so it gets done right and your treasure survives. As you plan out the organization of your genealogy binder or storage method, consider adding one photo of each of your ancestors to a single pocket and make sure each photo is labeled. Write a letter to your descendants - The most touching thing you can do is to write an open letter to your descendants and put it as the first few pages in your genealogy binder. In your letter there are two very important things to discuss. Let them know about yourself and why you developed an interest in your family history. Tell them about how you went about your research using both digital and traditional methods. Talk about your trips to courthouses, cemeteries, and distant relatives in your search for information. Imagine having the opportunity to read a personal letter from one of your distant ancestors and how that would make you feel. Next tell them everything about what you have on your CD or DVD and whether it contains any information which is not in your binder. For example, are there additional scans of other documents like census data or wills or military records. Be specific about what genealogy software you used and specifically what version. Are there any additional photographs of family members whether individually or at a family reunion. And finally give as much information as you can about what formats the various data is saved in on your CD or DVD. For example, JPG, GIF, BMP, PNG, PDF, DOC, and also any proprietary genealogy software format. This will give your descendants the knowledge of what they can expect to find and in the event your data is inaccessible, whether it will be worth it to hire a digital archaeologist to recover and convert the data into formats which are then currently in use. You should also encourage your descendants to "refresh" the data on the storage medium that you've left behind for them. Refreshing means copying your files from their old storage medium onto a newer storage medium to refresh and extend the lifetime of the data. Businesses and libraries with digital archives are now doing the same thing to preserve their data, and so must your descendants if your original data is to survive. Redundancy matters - In any future generation, the number of your descendants may be expanding or contracting depending upon marriage and birth rates. As a result, it's always a safe bet to make sure that there are multiple copies of your research to pass down whenever possible. Although it would be nice to think that every copy will survive the test of time, reality says that some copies won't. Natural disasters like fires and tornadoes can wipe out the only copy of your genealogy research and so can a childless marriage of one of your descendants who ended up possessing the only single copy of your work. So anticipate this and cover the possibility of loss by creating multiple copies of your life's work. They make great Christmas gifts to children, grandchildren, siblings, nieces, and nephews. In summary, the challenges facing today's family historian are different than at any time in the past. Digital assets are more fragile and subject to loss than any other form of record keeping and communication used in the past. Make sure that your message in a bottle survives and is readable by those who would treasure it the most. Please call us at 630-653-8400 or e-mail us at sales@ancestryprinting.com if you have any questions about printing your family tree charts or submitting your order. International callers can also Skype us if preferred; however, we ask that you email us to set up a convenient time for a Skype to Skype call. We are located in the central time zone of the U.S. (GMT/UTC-6 and -5 in the summer), and can make arrangements for incoming Skype to Skype calls up to around 10:00 PM local time on most nights. We only accept Skype to Skype calls that have been pre-arranged by email.